After winning its 5th straight Oceania championships in Geelong (Victoria) over the weekend, Sydney Uni is bound for Doha, Qatar, once again to defend its 4th place in the IHF Super Globe, the official club world cup. 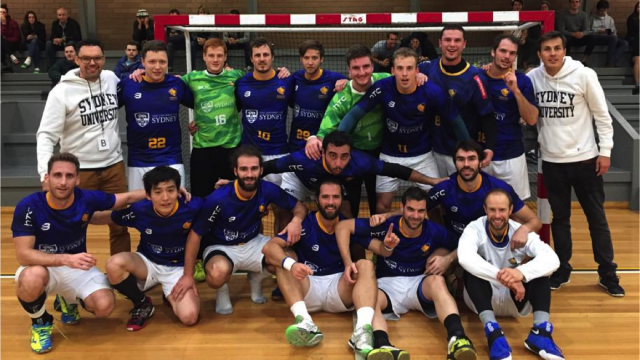 There was no doubt Sydney Uni entered the 2016 Oceania Club Championship as a favourite, having been the dominant force in club handball down under with four titles in a row since 2012 to their name. And while the boys in blue and gold defeated West Adelaide clearly 30:18 in the final, the run to take the cup was not without its hurdles. At the group stage, everything seemed to go swimmingly at first and Sydney Uni disposed of their opponents without any problems – cross town rivals UTS were defeated 38-20, Melbourne’s Deakin HC succumbed 11-39 and the New Caledonian team of Olympique de Noumea stood no chance at 9-45. The first game of the finals poule saw Sydney Uni HC then line up against their old foes of Saint Kilda Melbourne. Exactly as in previous years, the team from Melbourne was well prepared and played at eye level with the defending champions. In a game dominated by defensive lines and spectacular goalkeeping, Saint Kilda went into the break with a two goal lead (8-6), and kept the Enders boys at bay way into the second half. It was not before the 45th minute that Sydney Uni managed to get a lead, which they had to defend tooth and nail right to the end. Once again Saint Kilda, which was coached by former Australian national team coach Taip Ramadani, pushed Sydney Uni all the way, but failed to come away with a result. The 17:18 defeat also threw them out of contention for a spot in the final – as they had previously lost to newcomers West Adelaide HC by one goal. It was exactly this West Adelaide team which eventually squared up against Sydney Uni in the final on Sunday. The physically robust team counted on their tall back line with Lucas Turacek, Andreas Kommer and Laurent Busalski (both recruited from Perth) for attacking power – they could however not quite keep up with Sydney Uni’s speed and fastbreak play. Sydney brought their A game and steadily built their lead, going into the break with a comfortable 17-10. And all hopes of a come back for West Adelaide in the second half were destroyed by Sydney’s uncompromising defence, backed by an outstanding Ben Fogerty in goals. After just over 40 minutes the scoreboard showed 26-11 and Sydney had pretty much everything sewn up. While West Adelaide kept fighting and managed to reduce the deficit, the end result of 18-30 was still one of the clearest of results of an Oceania championship final in recent history. 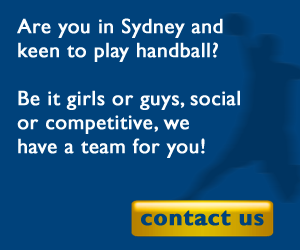 Sydney Uni has done it again, and also had three players recognised in the event’s All Star team. Caleb Gahan was voted best left back, Daan Versleeuwen best right back, and Pierre Bonnin got the crown for best pivot. Overall, it was undoubtedly the depth in Sydney Uni’s squad though which made the difference, combined with the international experience the team has now gained – having toured in Europe and also achieved a spectacular 4th place at last year’s club world cup in Qatar. Coach Philipp Enders pointed out the hard work throughout Sydney Uni’s 4 month preparation for the event – which he is satisfied has paid dividends again and sends his team on the road again to play the IHF Super Globe in Doha, Qata, in September. There, the Australian and Oceania champion will once again face opponents of a completely different calibre – namely defending Super Globe champions Fuchse Berlin and recently crowned European Champions League winners Vive Tauron Kielce from Poland. Sydney Uni line-up: Jerome Goris, Ben Fogerty; Minoru Tanaka (2), Krisztian Fodor (4), Oriol Garcia-Mila (1), Thibault Le Mabec (2), Pierre Bonnin (4), Daan Versleeuwen (4), Daan Kulker (2), Pablo Puentes, Hamed Ghorbani, Caleb Gahan (1), Tomasz Szklarski (8/5), Alejandro Cerro, Sebastien Traverso (1), Julian Doppler (1). Coach Philipp Enders, assistant coach Adam Molenda, manager Pascal Winkler, medical team Brad Prestidge and Jessica Fearnside.